68% of people who use disability services in Ireland are not satisfied with the level of control they have over their own lives : at Áiseanna Tacaíochta (ÁT), we work every day to change this. We facilitate Direct Payments to people with disabilities, and provide leadership and support to empower people with disabilities to be as independent as they can be, so that they hold charge over their own lives, just like everybody else. A Direct Payment is a cash payment made directly to an eligible person with a disability to enable them to purchase their care or support needs. Ours is an innovative and progressive approach. We work right across disability; we support both self-directed and family-led services; we operate on a spirit of volunteerism; and we develop in line with the lived experiences of our members. “Áiseanna Tacaíochta” is an Irish name, and it translates to English as “Supported Facilities”. Our goal is to make Independent Living open to everyone, and we aim to change the way we think about disability and to empower people with disabilities to re-write their roles in society. We work in two ways to achieve this vision: firstly, we act as intermediary between our members – who we call Leaders – and the Health Service Executive (HSE) and, secondly, we support people to support themselves. Our approach to Independent Living gives people with disabilities control over their own budgets and services in a way that’s never happened before in this country. We stand as the intermediary between the person with a disability and the HSE to set up a Direct Payment to the person. This means that we are responsible for dealing with the HSE and negotiating personal budgets on the person’s behalf. We also report to the HSE on the use of these budgets and on our Leaders’ compliance with other requirements, like governance, Personal Assistant (PA) contracts, Garda vetting, and more. Leaders provide us with this information through our monthly and quarterly reporting system. As part of this element of our role, we also support Leaders to establish and run their own companies so that their funding can be channelled directly to them. These are usually a Company Limited by Guarantee, although some Leaders operate as Sole Traders. As well as submitting financial reports, all Leader companies are individually audited, as is our organisation itself. This provides a double lock, ensuring the financial accountability of public funds. When a Leader receives a Direct Payment from the HSE, they use their budget to choose and manage their own services, mainly PA. This means that each person has the opportunity to decide when and how they use their services, ensuring that these supports fit in with their lives, not the other way around. We help Leaders in establishing their personal Circle of Support – made up of people from their local communities – to assist them with running their companies. Every person in the Circle brings their own skills and plays a different part in the company – covering everything from accounting and Human Resources to Health and Safety – so that the Leader is fully supported in everything that they do. We encourage Leaders to engage in our Peer Support Network – a group of people with disabilities and their families who support one another in pursuing their goals and living actively in their own communities. We believe that being a Leader means supporting your peeers and paving the way so that others can access the same rights. 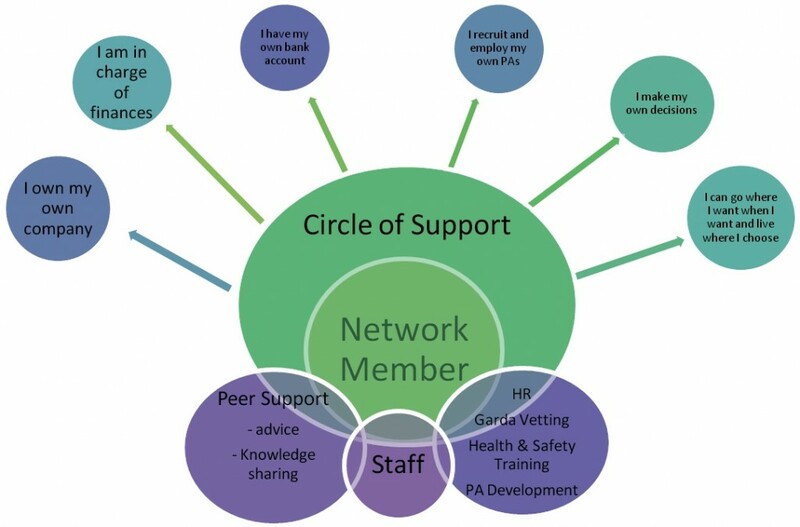 Our Peer Support Network sees Leaders connecting with new members as they too begin their journeys towards Independent Living, advising and mentoring them, training and upskilling them, and sharing their experiences so that success builds upon success. We pride ourselves on standing as a user-led network that promotes solidarity among people with disabilities, and that supports people to live as active and participating members of society in a practical way, by taking these first steps to full independence together. Our staff is always there to support Leaders. Whether it’s creating and supplying resources; providing information on setting up and running a company; organising training for Leaders, Circles of Support or PAs; or providing access to the Peer Support Network, we’re there at every step. We respond to Leaders’ needs and demands by undertaking continuous research and user-led evaluations of our work, and use that learning to ensure that we’re always listening and adapting to our Leaders’ experiences. We understand that running your own company and managing your own services can seem like a challenging idea. However, our Leaders are already doing it and reaping the benefits. We’re working across society, bringing everyone together to empower people with disabilities with independence, freedom and choice, enabling them to move away from depending on service providers and to enjoy control of their own lives, just like everyone else.